Now that we were back on the mainland we stayed a couple of days in the fishing town of Vilanculos. One memory that has stuck were the delicious, juicy crab claws that were supplied as ‘bar food’. So, we’d sit at the bar in the evening and eat our way through bowl after bowl. I don’t even like crab but these were different. Fresh mussels were also available. Somewhere, I think in Inhambane, we watched the African women collecting mussels off the rocks. When the tide was out, the women would walk out in stately single file. Picking their way across the rocks, with heavy metal buckets balanced on their heads, as a wave came in the women would throw their skirts up so as not to get them wet. As they did not wear underclothes, this was cause for much merriment for Wendy and me. I rather think Roland and Cliff either didn’t notice or were too embarrassed to laugh. Anyway, we bought a bucket of these mussels and I can remember how mouth-wateringly yummy they were. Another treat in Mozambique were the cashew nuts. You could buy a great big square tin for next to nothing. I remember we were going to take a couple of tins back home but ended up eating the whole lot. So, from Vilanculos we headed toward Lourenco Marques, now called Maputo, the capital of Mozambique. Slowly but surely we were moving back toward civilisation. Not long after we arrived in LM, I noticed that a wound on Kath’s heel was looking very red, swollen and lots of pus. Soon a red vein appeared running up her leg. I panicked. I knew this was a sign of blood poisoning. With no knowledge of the Portuguese language, we weren’t confident we could manage the hospital and doctor in LM. Roland and I decided to leave and head for my sister’s place in Rhodesia, near the Limpopo River. We bid a tearful farewell to Cliff and Wendy and off we went. We went through the border between Mozambique and South Africa at Komatipoort. I remember very little of the trip, just wishing the Land Rover could go faster. We crossed from South Africa into Rhodesia at Beit Bridge – border crossings were not a problem in those days. Soon, we were on the ranch where my sister, Win, lived. Win and I decided to take Kath back over the border to the mining town of Messina (now Musina) to see the mine doctor. In the event, Kath was given an anaesthetic – chloroform – administered in the old fashioned way, on a cloth. The nurse was the anaesthetist and assistant. Once she was anaethetised, the doctor started probing into her foot. It seemed to take hours and hours. He eventually found a small grain of coral deep in the flesh and plucked it out with tweezers. Coral poisoning is dreadful. Win and I stayed in the room all the time. Before Kath had even come round from the anaesthetic, we were on our way back to the ranch. We had to make the border at Beit Bridge before it closed. We scraped through but only because the officers knew Win. I don’t know if I ever told my sister how grateful Roland and I were for her help that day. She is truly the hero of the story. On the way back to the ranch, driving through the bush, we saw an aardvark. There is a good and kind blue witch. Her name is Agapanthus. Agapanthus is a good woman who keeps children amused and occupied with her magical stories. Agapanthus was my friend and ally on Bazaruto. I’m not sure where she came from but she was there when Kath and I needed her. As the lazy, sun filled days passed. As the tide came in, and the tide went out we realised that it was possible that our ferry had forgotten to come and pick us up. I don’t know if I was the only one who had some moments of anxiety. In the mean time, Roland and Cliff had taken cousin Wally back to Paradise Island (Santa Carolina) to catch a flight back to Salisbury. More importantly, they had made the trip safely although I seem to remember they told of a close brush with a big shark. To fill in some gaps: Cousin Wally had joined us in Inhambane or Vilanculos – probably Vilanculos. Roland says Vilanculos. Roland also says we left from Vilanculos and not Inhassoro – I do believe him as his memory for that sort of thing is a lot better than mine. Anyway, Wally was with us on the fishing boat going to Bazaruto from Vilanculos. So, now nobody knew where we were or how long we were going to be there – including us. Kath and I spent a lot of time with Wendy but she needed to have time for herself without us hanging around. Then Agapanthus came along and Kath and I became very attached to Agapanthus and her magical adventures. Agapanthus could sing, too. Admittedly, she used my voice and that was OK. Kath was young enough to think I had a lovely voice (I don’t, I am totally tone deaf). So, more-or-less, we were marooned on Bazaruto, not quite a desert island but near enough. In those days there was no telephone, not even a radio-phone, no electricity and there we were with a small child. How irresponsible were we? Roland and I, not Cliff and Wendy! Finally, one day, we saw a fishing boat waiting on the tide to come in. I don’t think I was the only one hoping it was there to pick us up. I suppose it was predictable that high tide was quite late in the evening when we were supposed to leave. All day we had watched storm clouds gathering. We knew this was not going to be an easy trip back to the mainland. Once the fishing boat was close enough, we clambered on board with all our stuff, including Cliff’s boat that was towed behind. The ferry had an almost illegible sign stating 5 crew and 12 passengers (something like that). Well, not on this trip! We were packed in with at least 30 people. Where they came from I have no idea. Our group chose to sit in the open stern of the boat because the overcrowded cabin was not pleasant. We are not talking comfort or luxury here. This was a working fishing boat and smelled like it; old fish and raw diesel fuel being the most noticeable odours. I sat on a coiled rope. I think the pattern of the rope is still imprinted on my bottom. Kath was curled up on my lap. Roland stood behind me, keeping Kath and I from flying off the boat, this was highly likely as the waves got higher and higher and the sea rougher and rougher. Cliff stood behind Roland. He was hanging on to the mast with one hand and steadying Roland with the other. Wendy was hanging on to Cliff. I can remember Alec’s hat blew off soon after we left the island and the Skipper wanted to turn back to retrieve it. “No!” we shouted in unison, “Keep going. Don’t turn back.” During the night the Skipper saw a light on the shore and, thinking it was Vilanculos harbour, turned toward it. It turned out to be a fisherman on the beach with a little fire to keep warm. I had heard of a ‘false dawn’ but had never experienced one until this frightening night. We didn’t know it at the time, but we were caught in the tail end of a tropical cyclone. In the event, Kath was violently seasick the all way back to the mainland and the trip took all night. Another thing we didn’t know was that Kath had a tiny splinter of coral in her foot and it was in the process of turning septic. There will be more about that in the next instalment. Thanks for your encouragement to keep writing this blog. I don’t know if I am enjoying remembering these things or not! This is really difficult, digging back in memory to find the holiday. Wendy remembers the young guide and ghillie but my memory of him is dim. I have no recollection of any of planning for the trip and rather think that Cliff and Wendy did all the organising. I do tend to be a ‘passenger’ even to this day. Be that as it may, the cabins where we stayed were (I think) the only buildings at the north end of the island, right on the beach. We never ventured as far as the south end of the island (about 37kms away) but I recall that there were some wealthy South African dentists camped there on their annual fishing junket. The cabins were double storey and so stuffy we all slept outside under mosquito nets. There was funny smell inside, too. Rats, definitely a rat stink. There was no electricity and no cooking facilities either. Glifford did a magnificent job cooking all our meals outside on a primitive barbecue. The first night in the camp I heard a curious rustling noise from inside the cabin. Roland wasn’t budging so I had to go and find out for myself what was going on. There were hundreds, if not thousands, of gigantic cockroaches in the shower, frantically hustling and rustling. “How can this be?” I thought. In retrospect, the insects must’ve been after water – although I have no recollection of any piped water into the chalet. After a couple of nights I got used to the rustling noise and ignored it. I doubt if we used the shower anyway, maybe to wash the salt off after swimming or maybe we just chose not to wash. Swimming in front of the cabins was not an attractive proposition. When the tide was out it was just mud (and sea cucumbers) as far as the eye could see. When the tide was in, I knew the worms were underfoot. The swimming beach was a short walk over the dunes, on the ocean side of the island. Each day Roland and Cliff would make a shelter for Kath on the beach. They broke branches from the casuarina trees that grew a short distance back and made a tepee to keep the sun off her. She would play in it and when she was tired she’d make a little sand pillow under her towel and sleep. Wendy and I would take turns to snorkel on the coral reef. Always, there had to be someone to keep an eye out for sharks. Sometimes we would swim together while Roland and Cliff kept watch. They spent a lot of time in Cliff’s boat, out fishing and we ate a lot of fish. Roland remembers some of the fish he and Cliff caught but I don’t. I did find a beautiful shell which I kept for years as a darning aid. It looked a lot like the one in the illustration but a darker brown. Next time (and I hope I can keep this up) I’ll tell you about the good witch, Agapanthus. I made up the story to keep Kath amused and it went on for many episodes. Then, there was the terrifying trip back to the mainland where we were caught in the tailend of a tropical cyclone. One of the shore excursions was for a small group of people (about 30) from the ship in Milford Sound (excuse to show you a photo), by launch to the Milford Sound landing. One of the group, a youngish woman with an older partner, attracted my attention as she had a stick and limped quite badly. I knew there was quite a lot of walking involved in this excursion and I wondered how she would cope. Very well, as it turned out! Walking Stick Woman was the first to board the tourist bus that was taking us to Queenstown where we stayed overnight, and then on to Dunedin. Because of the stick, WSW, and her partner, had the choice seats at the front of the bus. Actually, that was the last of we saw of the limp and the stick! At every scenic and/or rest stop she was up and down the bus steps like a gazelle. Each stop saw her posing (and I mean Posing with a capital P) for photos dutifully taken by her besotted partner. The tight leather pants were a mistake. It was cold on the cruise, especially in New Zealand and I had to buy warm clothes on the ship! The jumper I bought in an op shop (thrift shop) in a small town in the Barossa Valley, South Australia (on an excursion) because I was already regretting not packing warmer clothes. The beanie helped! I’m used to holidays in the tropics. It seems the only time I can bring myself to blog is when I am going away or blogging about where I’ve been. This is nothing to do with procrastination – or maybe it has a lot to do with procrastination? Is it worth having a theme to follow? Probably. What happens is this, something of interest in my life seems to end up on Facebook and never makes it here. In the event, we are going to Lombok next week; we being Roland and I. When I was there in May with Kath, Dean and Lily, I liked it so much that I managed to persuade Roland he might like it too. Recently, we were sitting chatting and he mentioned that maybe he was being a bit (a bit!) of a stick-in-the-mud so he’d like to go and have a look at Lombok. Before he could change his mind I had my laptop fired up and had booked and paid the airfares and the hotel accommodation! I made the booking for ‘earlier’ rather than ‘later’ and now ‘earlier’ is right upon us! Only 3 more sleeps. We will be staying in a homestay in Kuta (Bali also has a Kuta). The prices are reasonable and include breakfast. Have a look here Yuli’s Homestay What do you think? I’d love for my sister Win to come with us as she told me she’d like to do a trip like this. We are going to do a lot of exploring – I hope going to Mount Rinjani – the volcano which is still active. I think all the volcanoes in Indonesia are active. I don’t think we will climb all the way up but will certainly do what we can. The trek to the top takes 4 or 5 days … so I don’t think we’ll get anywhere near the Segara Anak Crater Lake. The mountain and the lake are sacred places. Mt Rinjani rises to 3,726 metres (12,224 ft), making it the second highest volcano in Indonesia. According to Wiki, “The Rinjani caldera forming eruption is thought to have occurred in the 13th century. Dated to “late spring or summer of 1257,” this eruption is now considered the likely source of high concentrations of sulfur found in widely dispersed ice core samples and may have been “the most powerful volcanic blast since humans learned to write.” I just hope it doesn’t choose when we are there to erupt again! Roland will be doing some fishing – it looks like there are some excellent fishing charters and pretty reasonably priced too. The current exchange rate is in our favour. 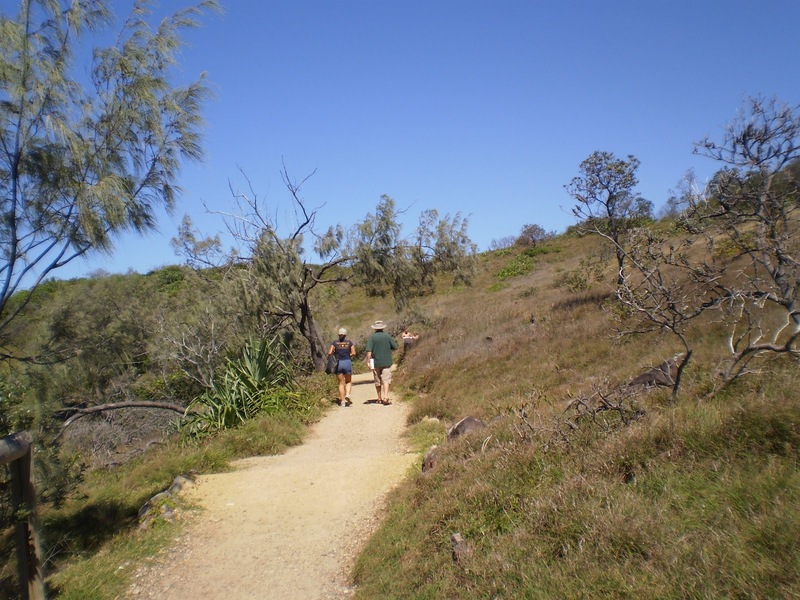 After some family time in the morning Heather, Roland and I walked the coastal leg of the Noosa Head Coastal Track. Dave dropped us at Noosa National Park and I took a photo of Harrold, the koala killed by a dog – poor little fellow, didn’t stand a chance. 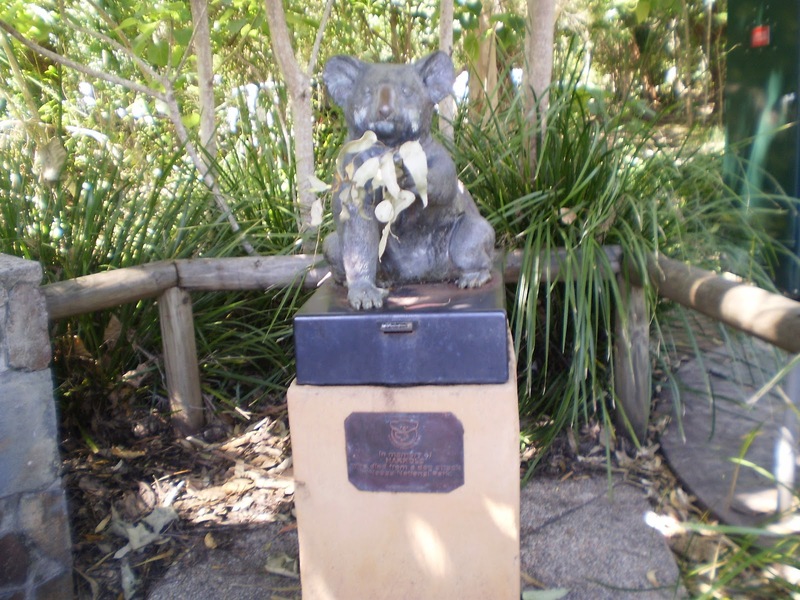 Someone had put a bough of gum leaves in his paw. So, on one side a sleepy koala and on the other side the roaring ocean. Steep tracks lead down to the rocky shore at this point and there are many surfers on the track – coming and going. For most of the track (5.4kms) I trailed behind Heather and Roland – both of whom are fast walkers. In places the track was very rough and I took my time so that I didn’t fall. Also, there was so much to look at and I didn’t want to miss a thing. Along the track there are places where the water is seeping through the surface. I saw a young man walking the track, barefoot, and he stepped right onto one of these patches and his foot sank right down into the mud. I had to laugh as it looked as though he had a shiny ankle boot on one foot! Quite far into the walk we came to Hell’s Gates, an awesome feature where the ocean channels into a narrow chasm. The sides are steep and rocky and there are no fences to stop people approaching the edges, only a couple of warning signs like these. I went as close to the edge as I dared (not very close) to take a couple of photos. Hell’s Gates & Alexandria Beach in the background. Alexandria Beach, politely known as as a *Clothes Optional* beach is a beautiful spot. Apparently very dangerous to swim although that didn’t seem to worry the au naturale people on the beach and in the ocean. 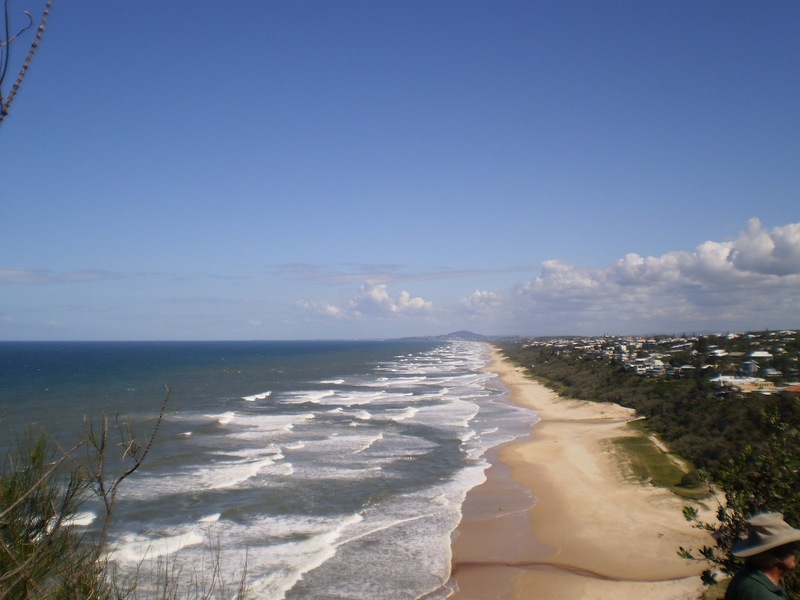 The ocean was very rough that day and although I was hot and ready for a swim, I wasn’t game to get naked and swim – too much sand swirling around in the water for my comfort. So I kept my clothes on and took my shoes off for the hike along the beach. I didn’t take any photos either, just this one from the track way above the beach. 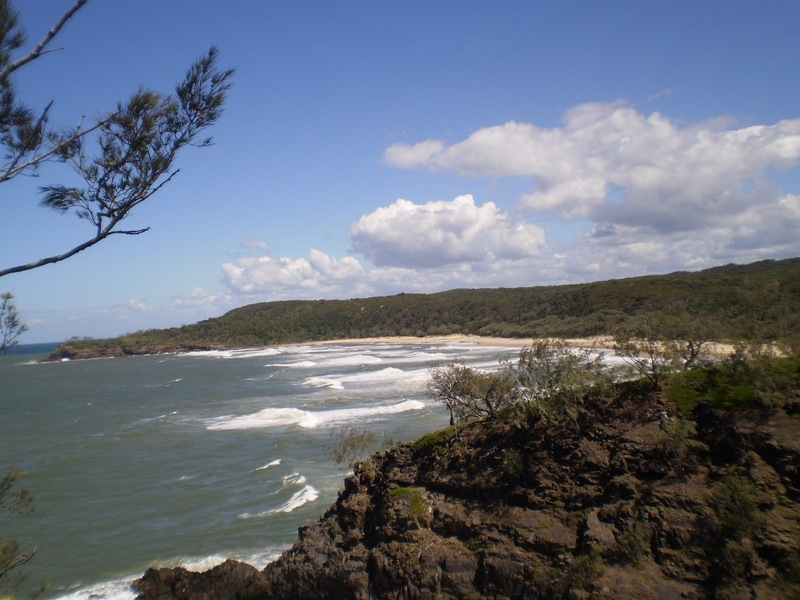 Dave met us at the far end of the beach, he had driven around so that we wouldn’t have to complete the full round trip through the inland track; also because there was absolutely no parking available at Noosa where we started the trek. The track was much rougher from here on, steep and rocky with some quite sheer drops. In one place there was a chain which was helpful and elsewhere the trees provided a handy support. I was excited to hear a Whip Bird – the first time I’ve heard one in the wild (we don’t get them here in Western Australia). I have been practising the call ever since. I can get the first bit – the whistle – but the actual cracking sound is more difficult. 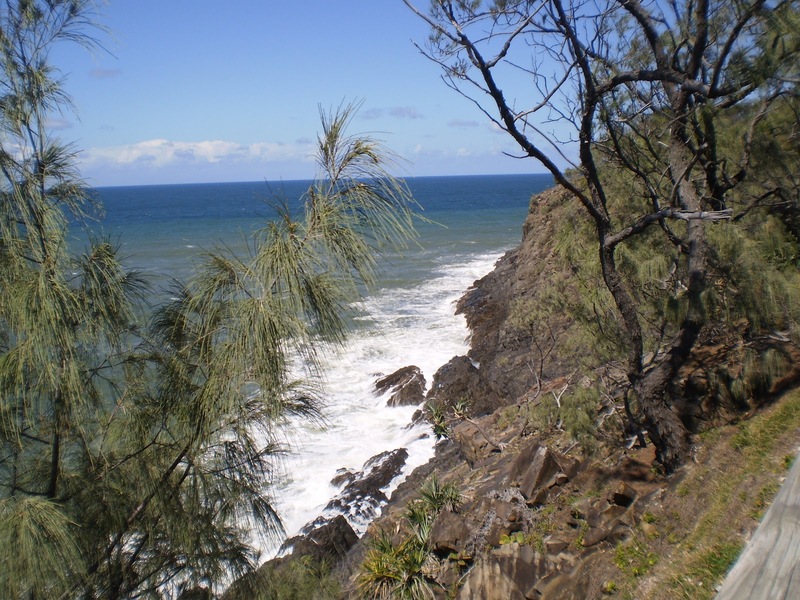 I think the others were heartily sick of me making these whistling, cracking sounds all the way down to Sunshine Beach. The walk had taken rather longer than planned – possibly because of my *slow/slower* pace! Anyhoo, we ended up in a delightful restaurant and hoed into a cold beer! Oh my did that taste good. Beer is not my usual choice of drink but this Boag’s was nectar. A late lunch of tapas and great company put the finishing touches to an amazing, wonderful walk. On the way back to Mooloolaba Heather suggested we climb Mount Coolum – seeing as it is *only* 200 or 300m high. While I would like to do that one day, this was not the day! In fact I was pretty tired by this time … have to remember, I’m pushing up to the high end of the 60s now.